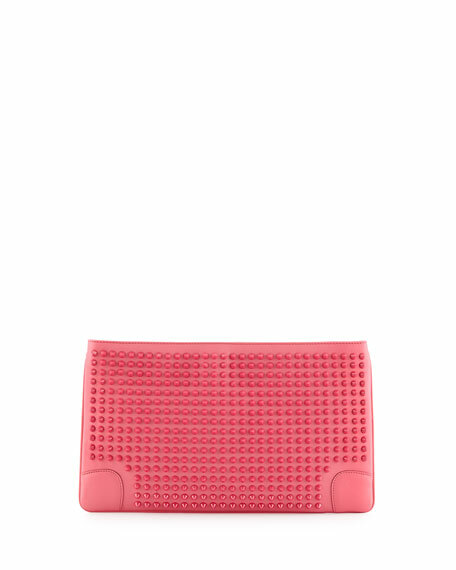 This Christian Louboutin Loubiposh clutch casts a playful edge with candy pink spikes and signature red accents. Christian Louboutin studded calfskin leather clutch. Tonal resin spikes; golden hardware. Removable chain shoulder strap with 21" drop. Dropped zip top seals slim profile. Signature Christian Louboutin red fabric lines interior. 7"H x 12"W x 1"D; weighs approx. 2lbs. For in-store inquiries, use sku #163602.